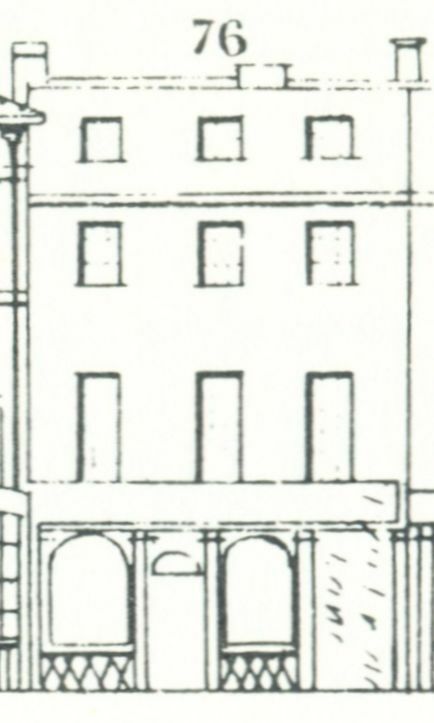 The elevation at the top of this post is from the original 1839 booklet of Tallis’s Street View of the Strand (number 19), but the index to that edition does not mention anyone occupying the premises, so it was presumably empty at the time. On the right-hand side of the building is the entrance to Ivy Bridge Lane; the name is not very clear on the picture, but the index lists Bridge Lane between numbers 75 and 76. 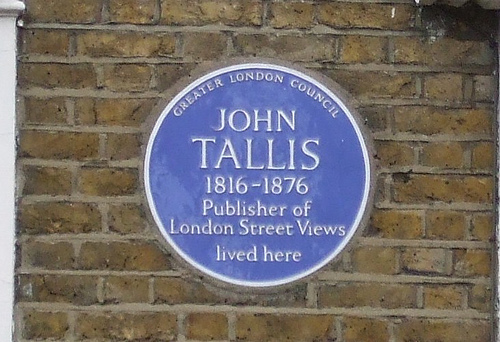 To confuse the issue somewhat, the 1847 edition of Tallis’s Street View calls it Ivy Lane. The official name was Ivy Bridge Lane and it is already depicted on the mid-16th century Agas map (see here). The lane used to slope down to the river (see for pictures here and here), but these days ends in Savoy Place. There are gates on either side of the lane, so no longer publicly accessible. 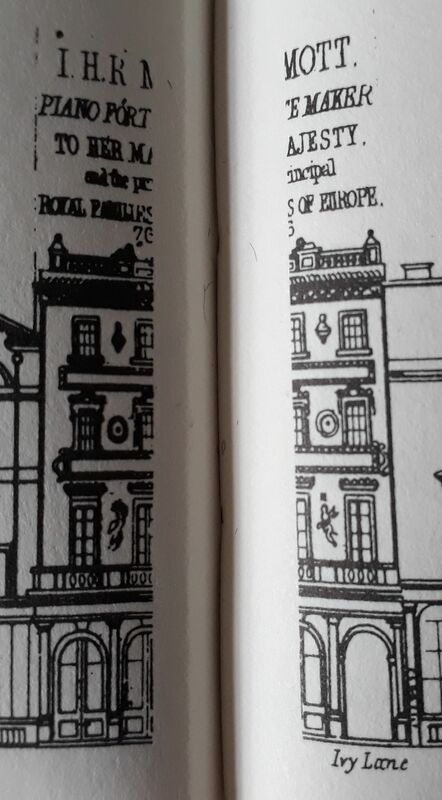 My facsimile copy of Tallis’s work unfortunately shows number 76 in the 1847 Street View across two pages, split in half on either side of the fold, so not very convenient to show at the top of this post, but as it looks as if the 1847 occupant embellished the front of his shop with fancy lintels above the windows and the figures of two angels (?) between the first-floor windows, I thought it best to show you the picture anyway. The occupant in 1847 was Isaac Henry Robert Mott, piano-forte maker. 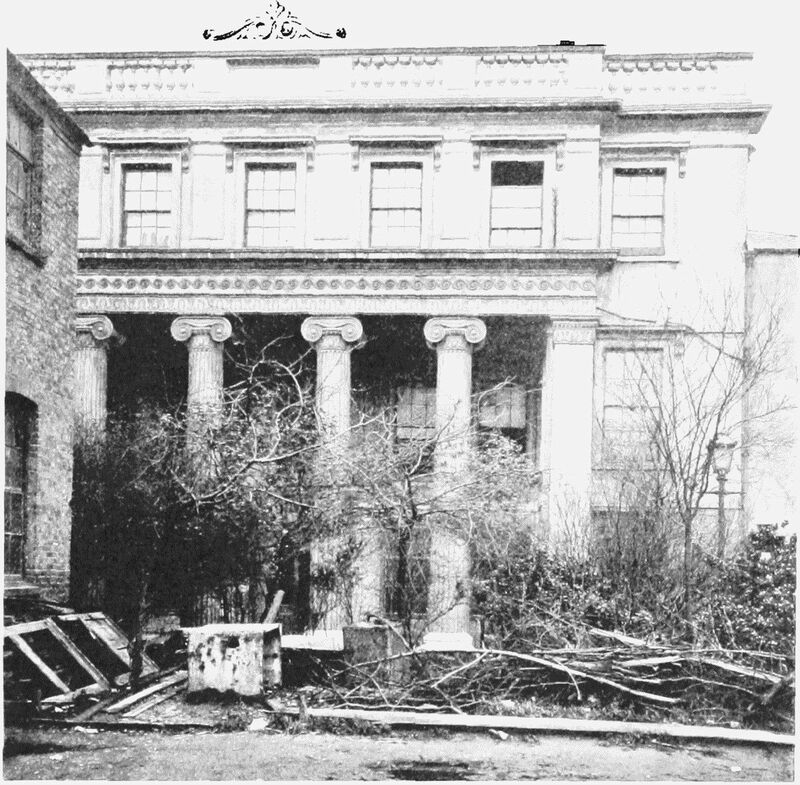 Isaac did not live above the shop, but from about 1830 to 1846 at Blythe House, Brook Green, Hammersmith, and later at Notting Hill. In the 1841 census, Isaac’s parents-in-law, George and Rebecca Jackson are living at Blythe House with one of their own daughters and six Mott children, three from Isaac’s first marriage and three from his second marriage to Rebecca Anne Jackson. (1) George Jackson was a ship and insurance broker of Billiter Court and he may have assisted Isaac financially when he was facing bankruptcy proceedings in 1840. (2) Blythe House was a rather grand building and most likely the property of George Jackson. When George died in 1846, his will (dated 1 October 1845) makes no mention of Blythe House, which suggests he did not own it. (3) Around 1846, Isaac Mott moved to Notting Hill, an event very likely to have been forced upon him by the death of his father-in-law; the baptism of the youngest child was registered at St. John the Evangelist, Ladbroke Grove, rather than at St. Paul, Hammersmith, as the other children from his second marriage had been. Isaac Henry Robert Mott had a rather checkered career: in 1814 he is listed as a musician at Birmingham, but from 1817 onwards we find him as a piano-forte maker and that is what he is certainly best known for. However, in 1839 we also find him as a distiller at 75 Dean Street and 3 Richmond Mews. The distillery business seemed to have been short-lived and may have been the cause of his bankruptcy in 1840 and is no longer mentioned in directories for the 1840s. Early on in his career, from 1814 to 1818 or 1819, Mott lived at Brighton where he developed the New Steyne Library and Assembly Rooms. 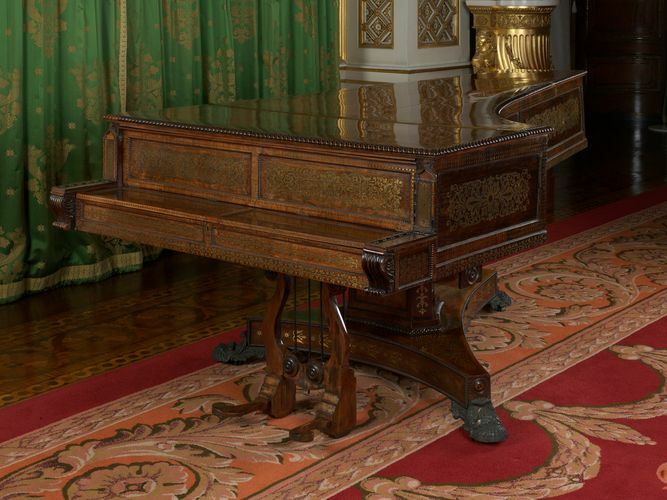 In 1817, he took out a patent for his ‘sostinente pianoforte’ and when George IV bought one of his instruments, his career was made. ‘Piano-forte maker to the king’ sounds much better than plain ‘music teacher and instrument maker’. Brighton could no longer hold him and Mott sought further fortunes in London; the library and assembly rooms he left behind were turned into the New Steyne Bazaar. See the article by Katherine Prior (@Churchwardress) in the Kemptown Rag of May 2018, page 15, for more on Brighton’s New Steyne/Steine and the link with Mott. Isaac and his cousin Julius Caesar Mott started a piano-forte business in Pall Mall, together with one John Chatfield, who may have been a relation of Sarah Chatfield, the stepmother of Isaac’s father. The partnership was dissolved in 1824, not entirely without acrimony, and Isaac continued on his own at 92 Pall Mall. 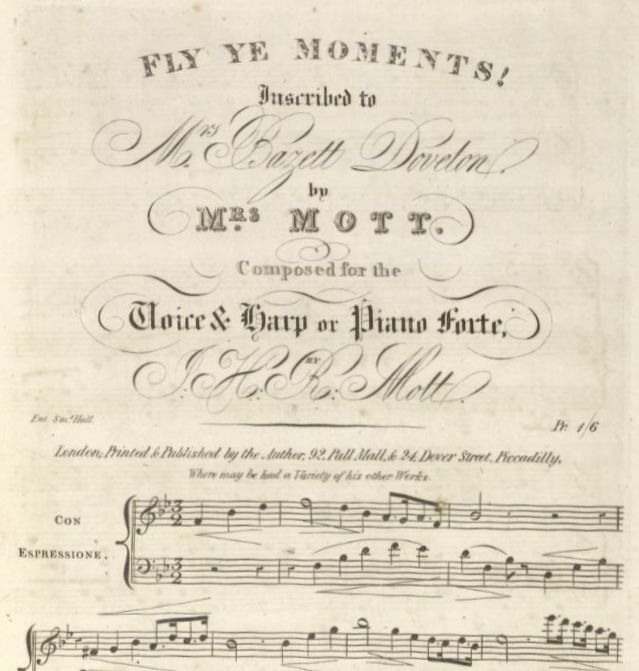 (4) For a short period, 1829-1832, Mott also had an outlet in Oxford Street, and the review of Mott’s Advice and Instruction for Playing the Piano Forte with Expression in The Quarterly Musical Magazine and Review of 1824 mentions 24 Dover Street, Piccadilly, an address that can also be seen on ‘Fly ye moments!’ and Sacred Melodies below. The first mention of 76 Strand is in an Old Bailey case of January 1842 where Mott had to testify as, in December 1841, someone had falsely claimed that 76 Strand was his address. Mott denied knowing this person and stated that he lived in the country and has his piano-forte “ware-rooms” at 76 Strand since mid-November. Mott explained that nobody lived at the premises and that he had no lodgers. There was only one small bedroom and his son slept there to keep an eye on the place at night. (5) The 1843 Post Office Directory duly lists his Strand address. It also lists a Mrs Rebecca Mott at 24 Old Fish Street as a carwoman, but whether she was Isaac’s wife or someone else altogether I do not know. From 1842 till 1849, Mott also had premises at 23 Poppin’s Court. The 1851 census shows Isaac, Rebecca and six of their children at 48 Norland Square, Notting Hill. 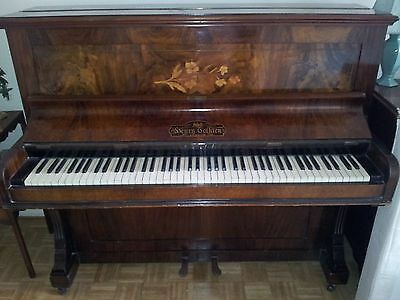 Isaac is listed as piano-forte maker, employing 12 men. 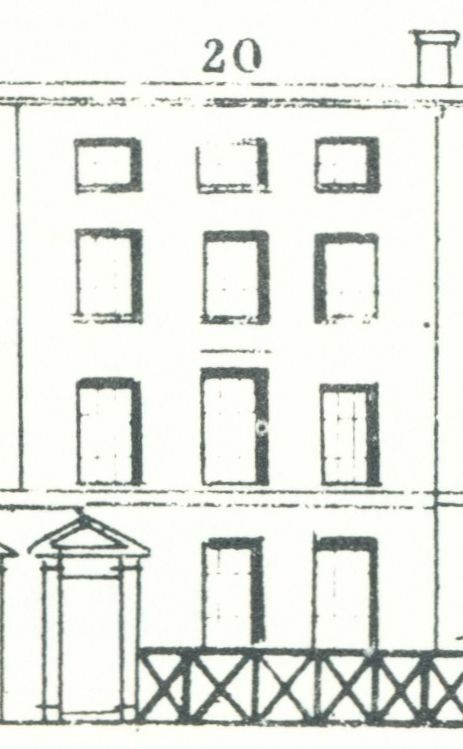 The Poppin’s Court property is no longer mentioned for Isaac in the 1851 Post Office Directory. In 1855, when on a business trip to France, Isaac died suddenly. R.E.M. Harding in her The Piano-Forte of 2014 lists “Mott’s Piano-Forte Athenaeum” in 1857, but the reference is without a source, so I am not sure where it came from. I have not found any indication that the piano business survived after Isaac’s death, so will end this post here. (1) Isaac married Fanny Rackstrow in July 1813 at Oxford. Their children were Henry Isaac Robert July 1814-Dec. 1814; Henry Isaac Robert July 1815-Oct. 1815; Henry George Dennison 1817-before 1874; Evelina Maria Christina 1820-1901; Rosa Fanny 1822-1892. Their mother Fanny died in 1826 and Isaac remarried Rebecca Anne Jackson in April 1830. They had 8 children: George Henry 1831-1906; Emily 1832-1875; Fanny 1834-1913; Arthur Robins 1835-1876; William Henry 1837-1923; Herbert Frederik 1839-1840; Ernest Charles 1844-1899; and Francis De la Motte 1846-1902. More on the Mott family here. (2) The London Gazette, 10 November 1840. (4) The London Gazette, 1 June 1824; and The Morning Post, 25 March 1824. (5) Old Bailey case t18420103-452. 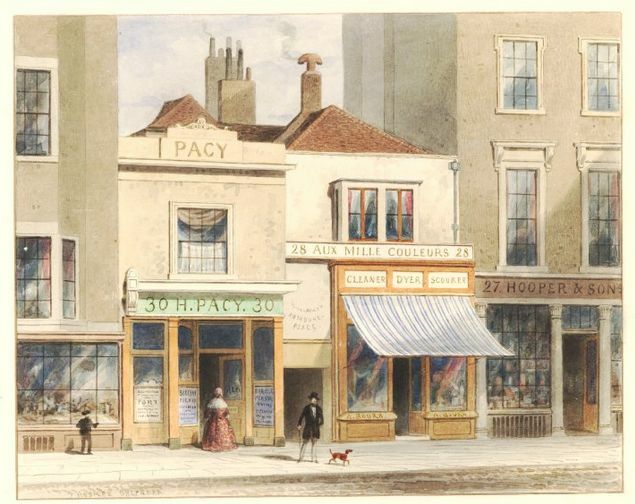 As we saw in the post on John Hooper, 28 High Holborn was occupied by his neighbour (and later father-in-law) Richard Swift, perfumer, but the last we hear of the latter is in 1831 when he took out an insurance policy with the Sun Alliance. Two years later, Eliza Huntley, hairdresser and perfumer, insures the property, but that is all we know of her. In July 1837, Emma Sarah, the daughter of Anthony and Julia Brown is baptised at St. Andrew’s, Holborn, and although no house number is given, the family lived at High Holborn. 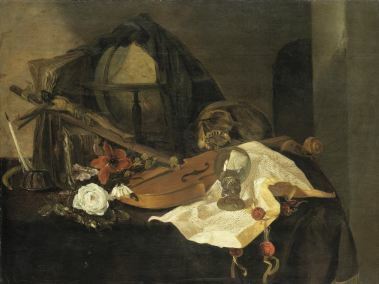 In the church record, Anthony is described as musical instrument maker. Although he was born in London, Anthony was originally called Antonio Bruno, as his ancestors were of Italian origin, but he anglicised his name to Anthony Brown. Pigot’s Directory of 1839 duly lists him at number 28. Tallis lists him at 28 High Holborn as violin, violincello and guitar maker, but he was not to stay at the address for very long. In the 1841 census, Anthony can already be found at 40 Upper Rosoman Street, Clerkenwell, still listed as musical instrument maker. At the same address we find Alexander Cheffins, professor of music, whom we came across in the post on 4 Mortimer Street. Both gentlemen only made a brief appearance at the addresses that Tallis listed and if he had published his booklets a year later, he might have missed them altogether. Anthony Brown was to remain at Upper Rosoman Street for quite some years, although he seems to have emigrated to Australia later in life. At some point in time he worked with Joseph Panormo, the brother of Louis Panormo whom we have encountered in the post on 46 High Street, Bloomsbury. I suppose musical London was not that big a place and we should not really be surprised that Panormo, Cheffins, and Brown were in some way linked. The next occupant of number 28 is Charles Laughton, a hosier, who was definitely there when the census of 1841 was taken, that is, on the night of 6/7 June. According to the Post Office Directory of 1848, he was still there, but, in the directory of 1851, he has made way for Henry Hart, clothier and outfitter. 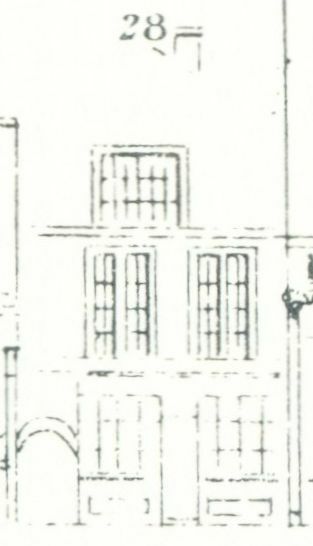 Around that time, Thomas Hosmer Shepherd, depicted the two small houses at 28 and 30 High Holborn. 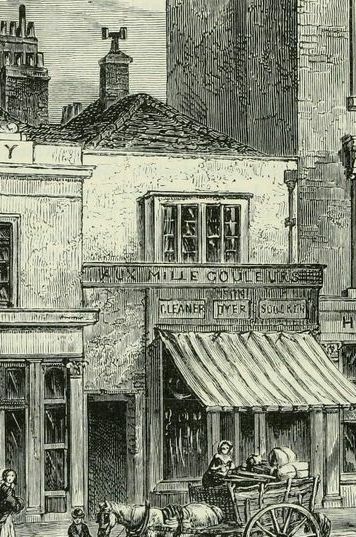 Both Shepherd and the engraver for Walford’s Old and New London give the shop at number 28 the name “Aux Mille Couleur” and above the windows the words “cleaner, dyer, scourer”, so the shop was certainly no longer occupied by Hart, the outfitter. The alleyway between the two buildings, behind the man and the dog, leads to number 29, the Coach & Horses whose proprietor Pacy also took over number 30. The 1851 census (30 March) tells us that Henry Hart is still at number 28, so the Shepherd and Walford drawings must date from a later period. The British Museum dates the picture to c. 1850 and J.F.C. 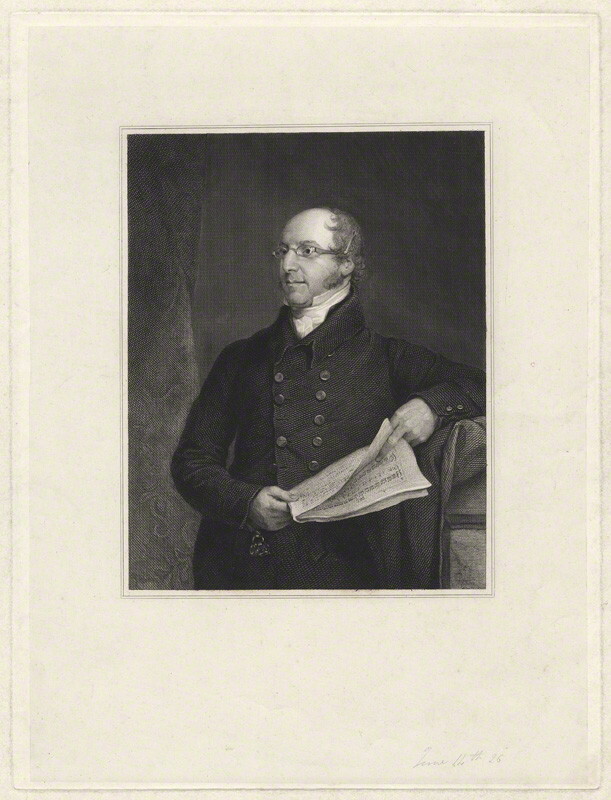 Phillips in his Shepherd’s London (1976) to c. 1852, which accords with the pencilled comment by J.G. Crace under the British Museum copy which says c. 1852 and that seems a more likely date than 1850 since Henry Hart is still at number 28 at the time of the census and is also listed in the 1851 Post Office Directory. The 1856 Post Office Directory gives ‘Boura Aimé, dyer & scourer’ which does corresponds to the lettering on the property in the two pictures. No comma between Boura and Aimé, so unclear whether Aimé is a first name. But the listing in the 1856 directory does not solve everything. There were two gentlemen of that name in London who were both listed as scourers and dyers: Julien Aimé Boura and Louis Aimé Boura, no doubt with a close family relationship. 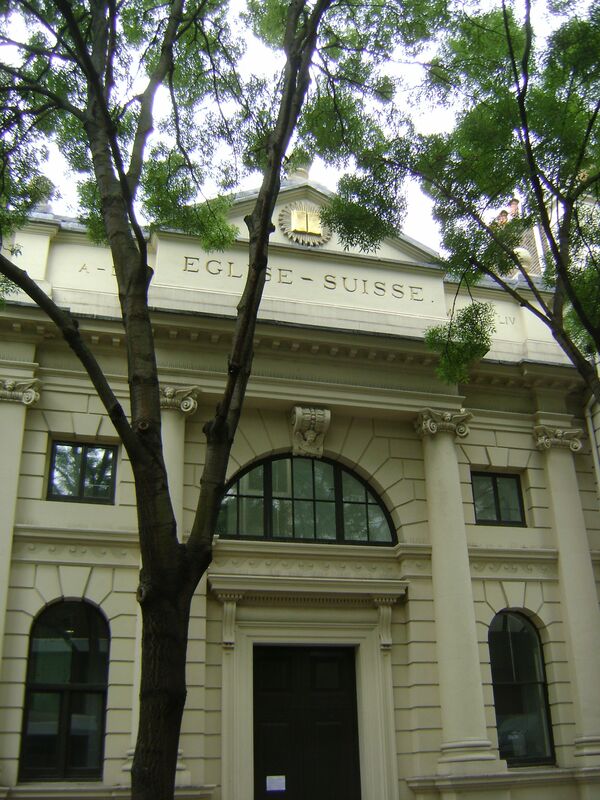 In the 1851 and 1861 censuses, Julien is enumerated at 42 Edgware Road and Louis at 31 Rathbone Place, so neither was living at 28 High Holborn. The Finsbury electoral register for 1865 lists an Aimé Boura at 28 High Holborn, but does not give more information. The 1841 census, however, lists Louis as Aimé Boura at Rathbone Place and an Old Bailey case confirms that Louis and Aimé are one and the same person. Boura states that he is a dyer of Rathbone Place and that “I call myself both names when it is required, but generally I do not give any name but Aime” and when asked to confirm that he had two names, “I have never been used to write only Aime — it is the name I have always gone by — it is my Christian name”; in other words, he is called by his second name, but uses both first names in writing. (1) This explains why the census and electoral register just use ‘Aimé’ as that was probably his answer to their question ‘What is your name?’. The 1861 census for 28 High Holborn shows a blank space behind number 28, so presumably nobody slept on the premises and the 1871 census even skips the number altogether. This would be the end of the story of 28 High Holborn, but for an invention by Louis Aimé Boura of Rathbone Place which was explained in The Patent Journal, and Inventors’ Magazine of 1848 and which I thought I’d share with you. 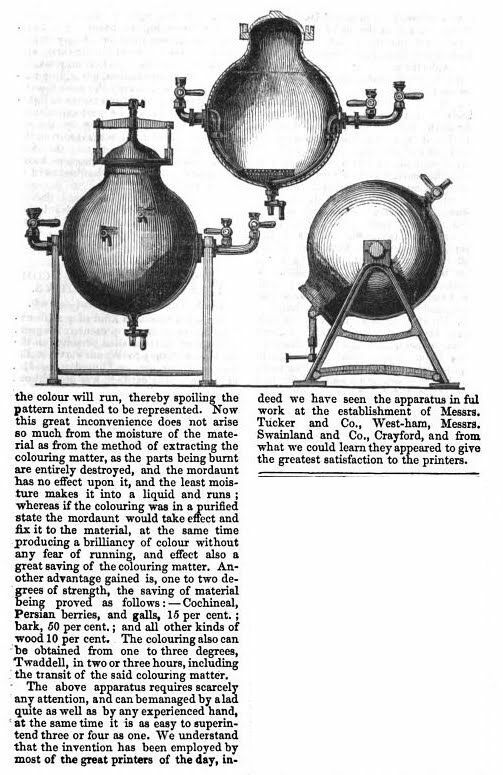 The contraption was also shown in the 1851 Great Exhibition. (1) Old Bailey Case t18420919-2638. The index to booklet 65 of the Street Views, lists Cheffin, music seller, at 4 Mortimer Street, but the elevation in the street plan gives the name of Morse, bookseller & stationer, so what is going on? 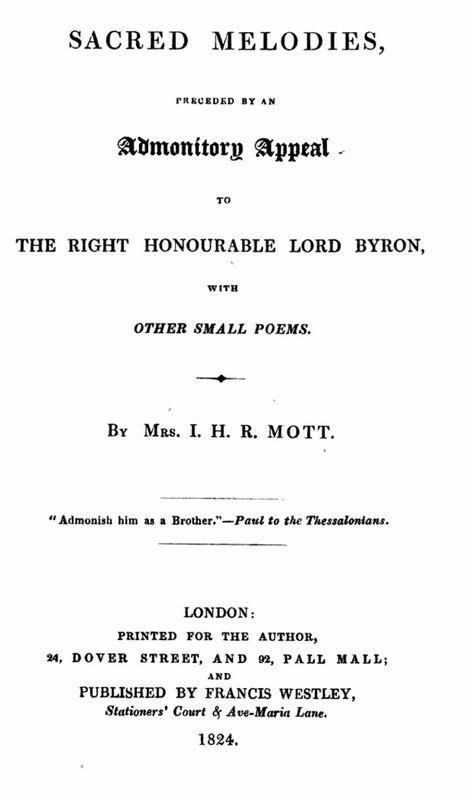 The bookseller was Edward Morse, who could be found at number 4 in Pigot’s Directory of 1839 and in the 1841 census, but that is more or less the end of the story for Morse, as I have not been able to find out anything else about him; he must have had a very short career indeed. I will leave Mr. Morse for what he was and continue with Cheffin whose name was usually spelled with an ‘s’, so Cheffins. If you search online for Cheffins, you will invariably end up with information about Charles Frederic Cheffins, but that was Alexander’s brother. Charles was the elder of the brothers and baptised in December 1807 at St. Bride’s as the son of Richard and Jane Cheffins. Richard Cheffins worked for the New River Waterworks Company and was a member of the Pattenmakers’ Company, although he described himself as surveyor on the indenture document when he took Charles on as his apprentice in 1822. Charles had a glittering career as mechanical draughtsman, lithographer, cartographer, consulting engineer, and surveyor. He published many maps, of which the majority depicted new railways that were either proposed or being built. Whatever the reason for Alexander’s change of profession, from 1859 onwards he is variously described as draughtsman or surveyor. In other words, he followed in his father and brother’s footsteps. And in 1865, he is given a provisional patent as a mechanical draughtsman for an invention to improve the construction of omnibuses. (4) In 1871 and 1881 the census found him at Kentish Town. He died in 1885. Son Edwin had a similar job change as his father; in 1871 he was listed as a railway clerk, but in 1881 as a pianoforte tuner. Music, drawing and mechanics were apparently skills that went together in this particular family. And 4 Mortimer Street? We saw Edward Morse there in the 1841 census and he had his name plastered on the front of the building in the Street View, but most of the building must have been overrun by the women of Anna Maria Hammans’s milliner’s business. The occupation of the building by the Hammanses pre- and post-dates that of Morse and Cheffin, so it seems that it was a multi-business property. The Hammanses were already there in early 1834, when Maria and Rebecca Hammans of 4 Mortimer Street dissolve their partnership, but possibly long before that. (5) In 1841, Anna and at least nine women were living at the property, besides bookseller Morse, a porter and three gentlemen who were listed as independent. One of the milliners was Elizabeth Abrahall who is mentioned in Anna’s will of 1845 as her sister and who is left the business. (6) The 1851 census does indeed see Elizabeth Abrahall at number 4 as dressmaker, although the 1851 Post Office Directory still has the name of Anna Maria Hammans for number 4. The 1856 Post Office Directory names the firm Mrs Elizabeth Hammans & Co. By 1861, however, her place has been taken by Eliza Johnson, a lodging house keeper. And is this the whole story? No, censuses and Tallis do not tell us everything. We know, for instance, that in 1848, one Jacques Robert Lavenne, heraldic engraver and fancy stationer, was listed as “late of no. 4” in the bankruptcy records. And the same goes for John James MacGregor, surgeon, who had to appear before the commissioners in 1855. What does seem clear is that 4 Mortimer Street, contrary to many long-running single-family businesses listed in the Street Views, had numerous occupants, as well as a resident family not mentioned in Tallis, in the years just before, during and after the period in which Tallis produced his booklets. (1) Charles was buried at All Souls, Kensal Green 28 October 1861. England & Wales, National Probate Calendar (Index of Wills and Administrations), 1861. Estate valued at under £35,000. Sons Charles Richard and George Alexander were two of the executors. (2) Children: Frederick, bapt. 22-05-1838; Anne Louisa, bapt. 21-8-1839; Henry Alexander, bapt. 31-10-1841; Richard Albert, bapt. 8-9-1844; Julia, bapt. 8-11-1845; Herbert George, bapt. 23-05-1852; Edwin John, bapt. 17-9-1854; Alfred Courtenay, bapt. 8-6-1856; and Percy Frank, bapt. 28-8-1859. 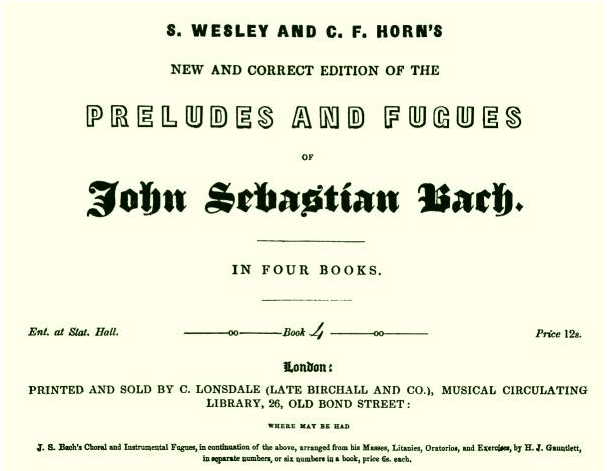 (3) British Library music collection H.282.o.(8). (4) Patent Office, Chronological and Descriptive Index of Patents, Cheffins, 27th July 1865. (5) The Hammanses came from Garford, Berkshire. Rebecca, Maria, Anna Maria and Elizabeth were all daughters of William Hammans and his wife Elizabeth. (6) PROB 11/2022/350. Elizabeth Hammans had married John Abrahall by licence on 28 July 1828. 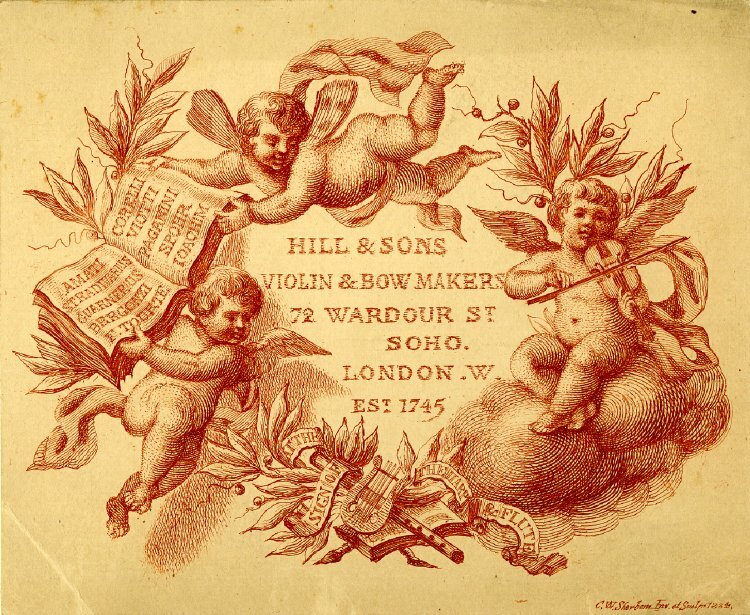 In The Times of 17 July, 1829, an advertisement appeared for music lessons (piano and harp) at Mr. Serquet’s, harp manufacturer, of 77 Great Tichfield Street, Portland Place. Private lessons at the advertiser’s address were 3 guineas a quarter with 2 lessons a week. In this case no initial or first name is given for Mr. Serquet, but an advertisement in the same paper of 26 February, 1836, tells us that we are dealing with E. Serquet. This time he “begs leave to acquaint the nobility and gentry that he has a splendid collection of new and second-hand double-movement harps” for sale or hire. 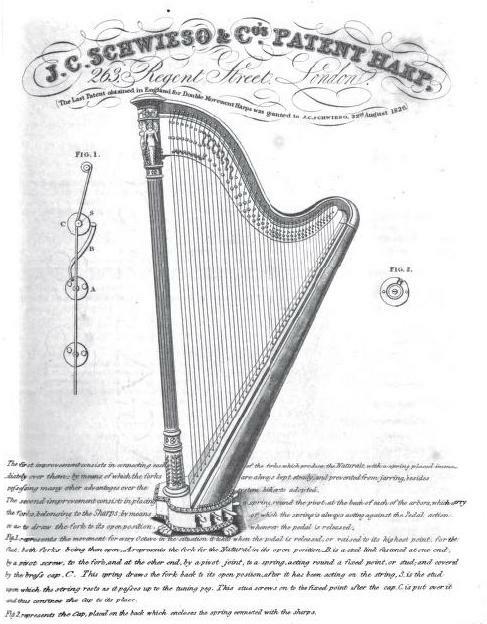 The harps were manufactured by himself, by Erard, by Erat, etc. and were suited for any climate. So, if you happen to be leaving for India, you were “solicited to inspect the above”. 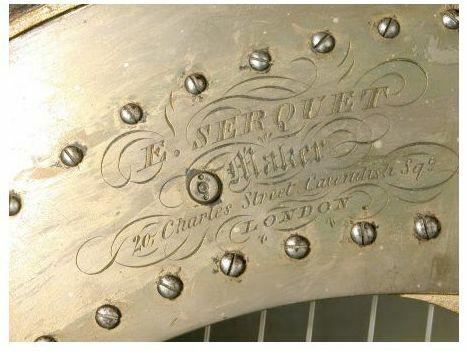 E. Serquet, that is Emanuel Serquet, must have moved between 1836 and 1839 to 20 Charles Street, frequently referred to as Charles Street, Middlesex Hospital, or Charles Street, Cavendish Square, to distinguish it from the other Charles Streets in London, as we find him there in the Tallis Street View. Charles Street has now been incorporated into Mortimer Street, but in Serquet’s time, the section between Wells Street and Goodge Street was called Charles Street. An indication of Serquet’s country of origin can be found in an advertisement in The Times of 26 May, 1851, where the annual sermon for the poor at the Swiss Church in Moor Street, Soho, is announced and Serquet’s address is mentioned as one of the places where donations could be handed in. The 1851 census entry does indeed gives place of birth for Emanuel as Switzerland. He is then a widower and 61 years old. When he came to England is unclear, but he was certainly in London in 1822 when he married Frederique Louisa Esther Delechat at St James, Piccadilly, on the 6th of May. As far as I can find out, the couple only had daughters, of which Malvina, born in 1827, was probably the most talented. Already in 1851, we find her as “professor of music” in Walthamstow and after her marriage to James Dryden, a mercantile clerk, she is still styled thus in the 1861 and 1871 censuses. 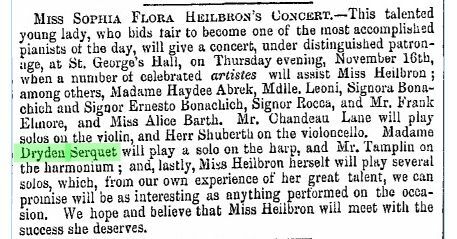 In 1881, 1891 and 1901, by then a widow, she is still classed as “professor of harp, piano & singing”. She dies in 1910. The last reference I found for Serquet is in the 1856 Post Office Directory and in the 1861 census, 20 Charles Street is occupied by other people. I have not found a record of Serquet’s death, but he presumably died between 1856 and 1861. He may just have lived long enough to see the inauguration of the new Swiss Church in Endell Street. 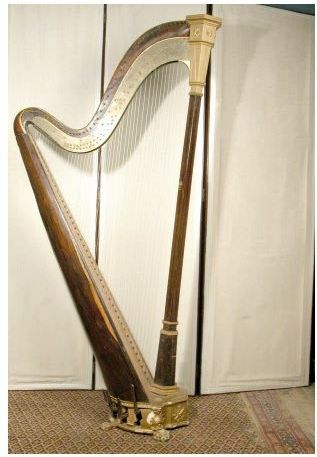 Serquet’s harps can still be found around the world and are treasured possessions of various museums. 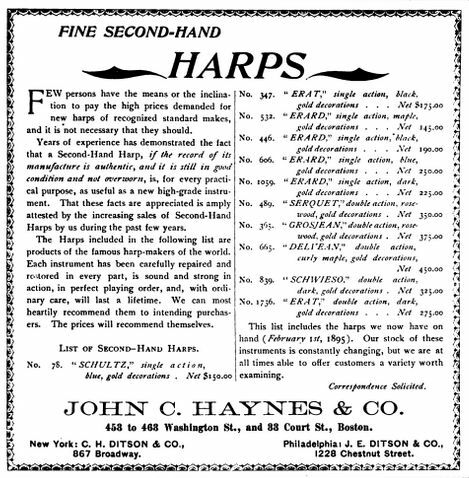 Advertisement in The Musical Record of June 1895 in which Serquet, Grosjean and Schwieso are described as among “the famous harp-makers of the world”. (1) The London Gazette, 25 May 1824. (2) Rootsweb and R.E.M. Harding, The Piano-Forte (1933). (3) The London Gazette, 26 June 1827. 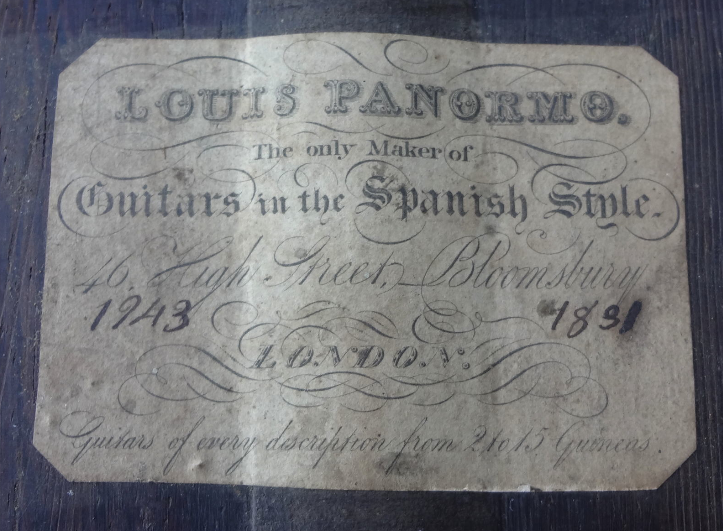 In the first quarter of the nineteenth century, the six-stringed guitar was introduced into England and one of the best maker of such guitars was Louis Panormo. His father, Vicenzo Panormo (1734-1813), originally a violin maker from Sicily, came to London via France with his four sons. The whole family was musically minded and many Panormos found work in London as instrument makers, musicians, music publishers and composers. There were to begin with Vicenzo’s four sons, Francis (1763-1843), Joseph (1768-1837), George (1776-1852) and Louis (1784-1862), but the next generation, Ferdinand (c.1795-1882), Robert (c.1803-1873), Edward (1811-1891), George Lewis (1815-1877) and Angelina (1811-1900) were also involved in the world of music. George Lewis, the son of George, will figure later in the story of Louis’ business. 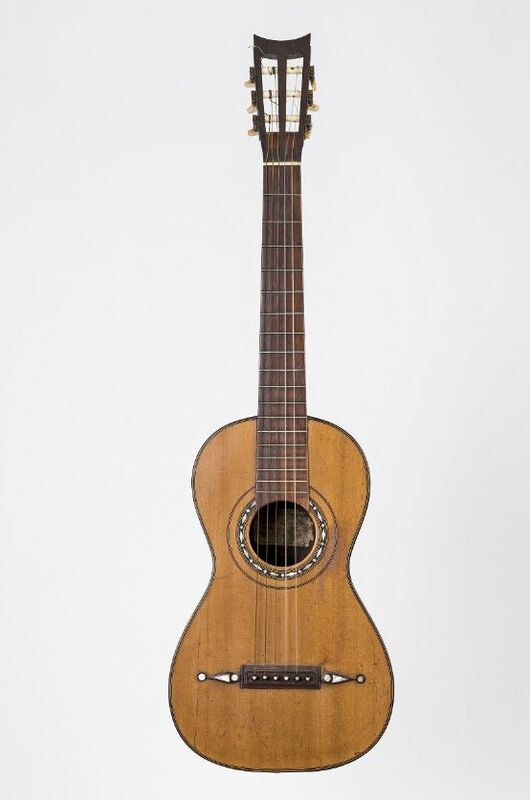 Louis styled himself “the only maker of guitars in the Spanish style”. Whether that was true is debatable, but it made a good advertorial phrase and he had it printed above the elevation of his shop in the Tallis Street View. Two days later, the paper continues the letter conversation and Miss Yelverton wrote rather despondently “If you have got the guitar I will learn it, in the hope of doing something to please you, having hitherto failed in all my accomplishments”. 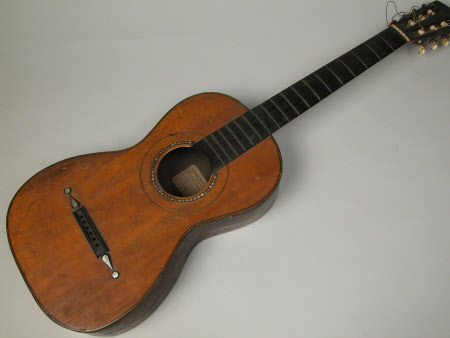 Whether the Major bought the instrument and whether Theresa did indeed learn to play the guitar is unclear, but what is clear, is that Panormo’s name as a guitar maker was apparently highly regarded in Ireland from where Yelverton wrote his letter. The famous Spanish guitarist Antonio Trinitario Huerta (1800-1874) had come to England in 1827 and played on a guitar made by Panormo. This seems to have been a mutual benificial arrangement; the famous guitarist using a guitar made by London’s famous guitar maker. 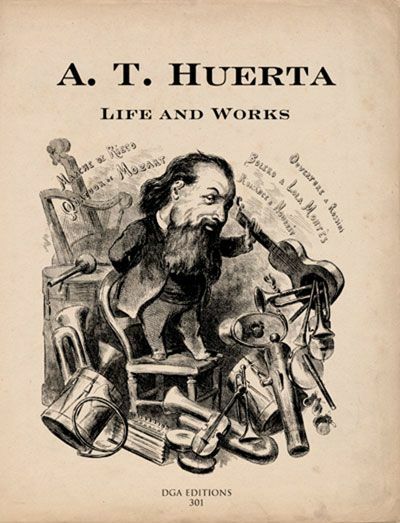 Panormo published Huerta’s Divertimentos which were dedicated to his student, Louis’ daughter Angelina. She married Huerta in 1828 when she was only 17 years old and the couple lived in Paris for a while, teaching the guitar, she to the ladies, he to the men. But ten years later, Angelina was back in London with her children while Huerta lived – apparently separately – at Brighton. 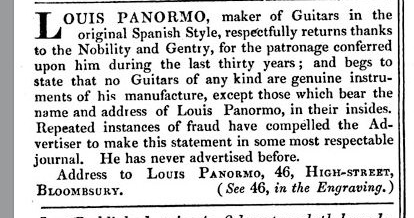 Information that has not been given a footnote, came from Gary Southwell, The Panormo Guitar and its Makers, London College of Furniture (1983; online here) and James Westbrook, “Louis Panormo: ‘The only Maker of Guitars in the Spanish Style'” in Early Music, vol. XLI, no. 4 (2013). (1) Old Bailey Case t18360404-1029. Stolen: 3 saddles, 1 pair of traces, 1 pair of harnes, 1 breeching, 1 bridle, 1 pair of reigns, 1 martingale and 1 horse-cloth. Total value 79s. (2) Freeman’s Journal and Daily Commercial Advertser, The Longworth-Yelverton Letters, 10 January 1863. Date of the actual letter not stated. See the Wikipedia pages for Yelverton and Longworth. (3) England & Wales, National Probate Calendar (Index of Wills and Administrations), 1877. Street Views: 1 and 18 Suppl. Henry Tolkien was baptised on the 26th of September, 1814, at St. John’s Clerkenwell as the son of George Tolkien and his wife Eliza Lydia Murrell. Father George is described as a glass seller, living in White Lion Street. On the 23rd of September, 1840, Henry marries Amelia Sophia Barber at St. Olave’s, Southwark and three years later, he applies for his freedom of the City of London by redemption (that is: by paying a fine of £5.3.6) through the Company of the Loriners. But he must have been established at 28 King William Street before his official freedom, as we find his name in the Tallis Street Views which were published in 1839. Number 28 is situated in the section of King William Street between Crooked Lane and Arthur Street and where, coming from London Bridge, King William Street bends to the left and Gracechurch Street begins. As Tallis explains in his booklet, King William Street formed the new access from the foot of New London Bridge to the Bank of England. According to Tallis, it “consists entirely of large houses, appropriated to Insurance Company’s, or shops” and “it will rival any of the new improvements in London, for its great architectural beauty”. See the post on Henry Blenkinsop for a shop that had to be demolished for the new approach to the bridge. The earliest newspaper advertisement I found for Henry Tolkien is in The Morning Chronicle of 18 May, 1841, from which we learn that he not only sold and published music as the index to the Street Views stated, but also musical instruments. 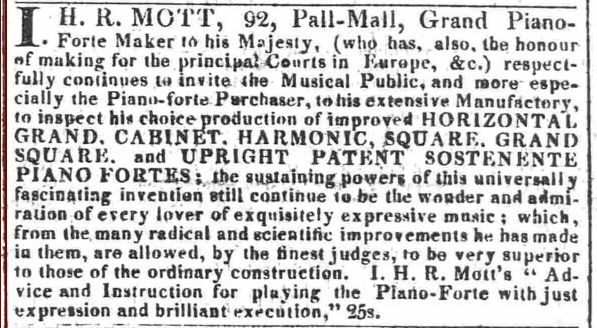 The advertisement mentions pianos, such as the “much admired piccolos in mahogany and rosewood cases” for 28 guineas, or if you preferred them in zebra wood, they were 31 guineas. Still not enough luxury for your taste? Well, why not buy a cottage piano “with double columns” and “lion scrolled legs” for 36 guineas. 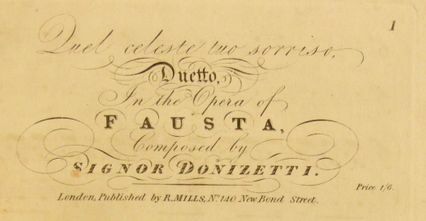 In September 1854, a number of music publishers were summoned to appear at Guildhall to answer complaints from Antonio Panizzi, the keeper of printed books and manuscripts at the British Museum(1), for not delivering copies of certain works of music to the library within one month after publication as they were required to do according to the Legal Deposit rules. The library section of the Museum is now the separate British Library, but the same deposit rules still apply (see here). Tolkien was the only publisher to appear at Guildhall and the charge against him was that he had neglected to send the library a copy of “The Guardsman’s Farewell” (price 2s 6d). To begin with, Tolkien said that he thought the Museum was rather sharp as the music had only been published a few weeks before and the omission to send a copy was entirely accidental. The Museum denied being sharp and in any case, Tolkien “had not delivered any work for years”. Tolkien then changed his excuse for non-delivery by claiming that he was not aware that he was required to send a copy as all the works he published were reprinted and out-of-copyright foreign productions. 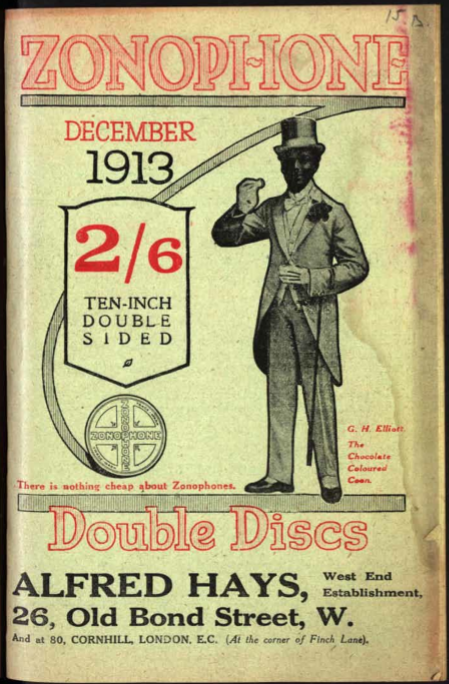 And the same productions were published by every other London bookseller and the Museum would have a hundred copies of each piece of music if all these reprints had to be submitted. 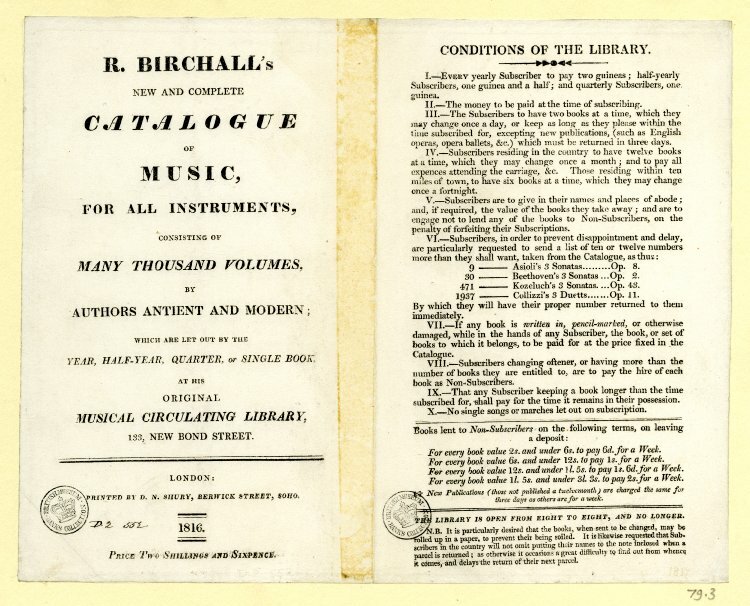 Alderman Farebrother said that music sellers were not required to send in music imported from abroad, but if they reprinted the music in England, they must send a copy to the British Museum. Tolkien said that as soon he had been made aware of that rule, he had sent a copy to the library, but they had refused it. The library replied that it had been refused because the summons to Guildhall had already been issued. Oh dear. To cut a long story short, Tolkien had to pay a 10s fine, the cost of the case (4s) and he was to send the disputed copy to the library. (2) Where, by the way, it still resides under shelfmark H.1756.(12.). And yes, in case you were wondering, Henry and J.R.R. are related. J.R.R. was the grandson of John Benjamin Tolkien who was Henry’s elder brother (see more on the Tolkien family in general here and on John Benjamin in particular here.) And for a portrait of music publisher Henry see here. (1) Update 15 September 2015: post on Panizzi on the Untold Lives blog of the British Library. See here. (2) The Morning Post, 6 September 1854. (3) London Gazette, 29 May 1857. (4) England & Wales, National Probate Calendar (Index of Wills and Administrations), 1886. In c. 1790, Valentine Metzler came to England from Bingen on the Rhine, Germany. 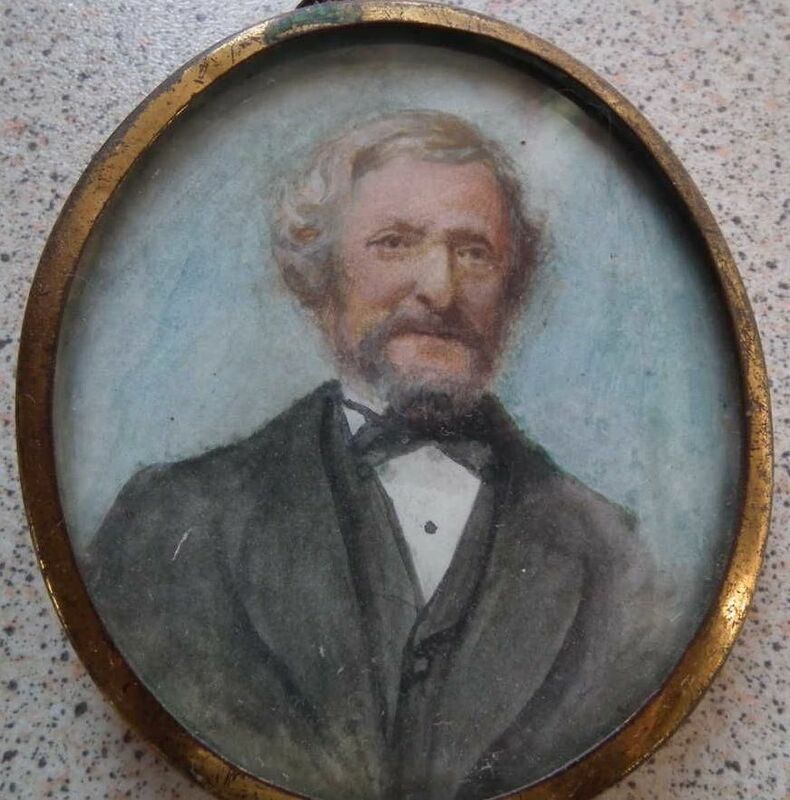 He married an Englishwoman and their only son, George Richard (1797-1867) joined his father in the business, as did George’s son, George Thomas (1835-1879). 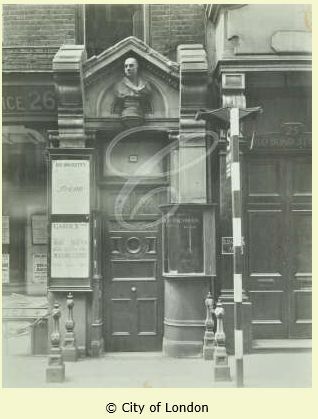 (1) The earliest record I found is a July 1794 entry in the Sun Fire Office where Valentine insures premises at 344 Oxford Street. 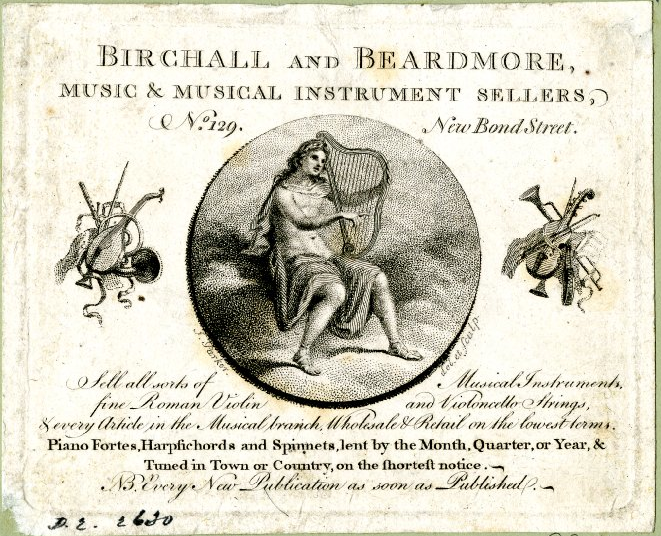 He describes himself as ‘wind musical instrument maker and dealer in iron and rags’. The next insurance record is for 1822 when Valentine and George can be found at 105 Wardour Street where they are ‘musical wind instrument makers and dealers in musical instruments’. 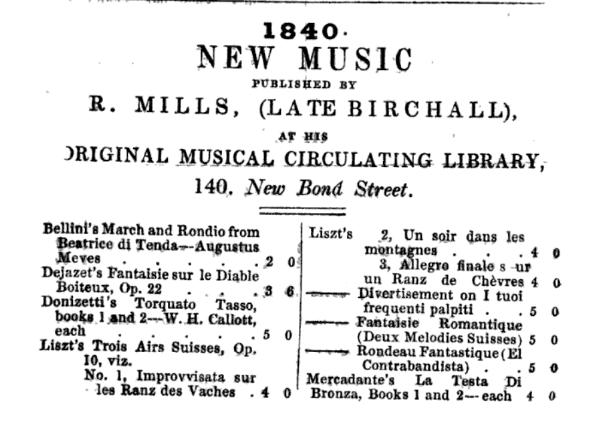 An 1828 advertisement in The Harmonicon announces “New comic songs” that were published by the Metzlers and also the arrival of a shipment of Spanish guitars. 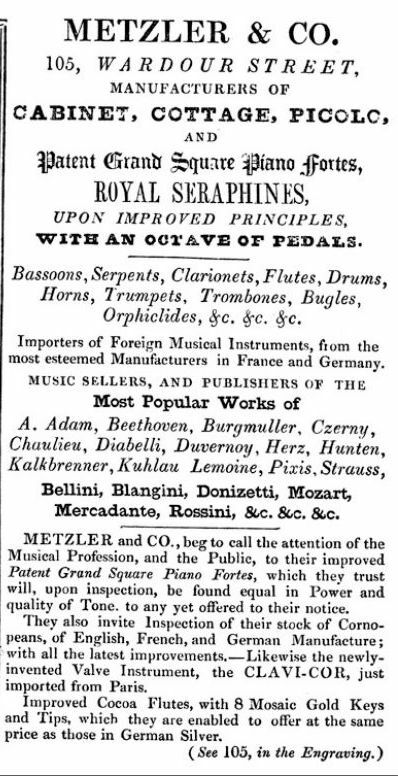 In 1836, they advertise their improved seraphines in The Musical World which are “capable of giving effect to any organ music, at a price less than one fourth the cost of an organ of the same power and depth of tone”. In late 1839, George Richard registers a pianoforte damper for which he gets a one-year copyright. (2) A few years later, Metzler & Co move to Great Marlborough Street, starting at number 37, but expanding over time to include the neighbouring properties. As can be seen from the advert Metzler & Co had in the Street View booklet, they sold much more than just piano fortes. 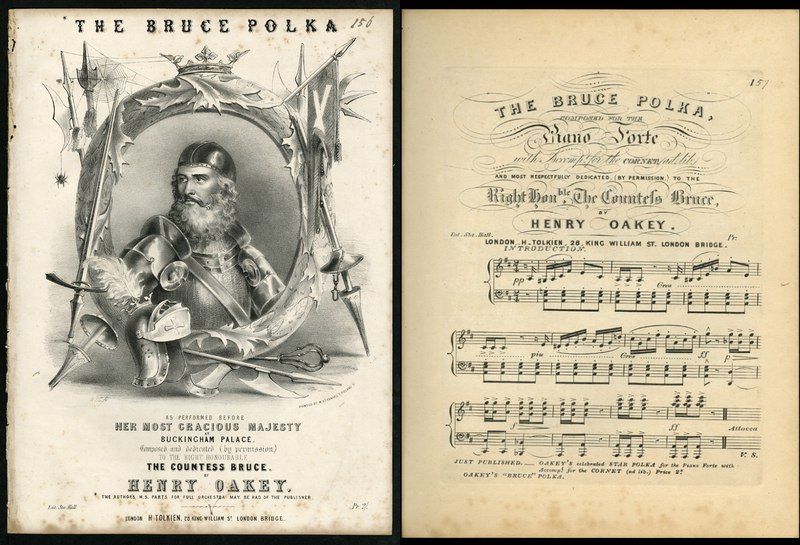 Not only did they sell all kinds of other musical instruments, such as flutes and drums, they also sold and published music. George Thomas was a gifted songwriter himself. 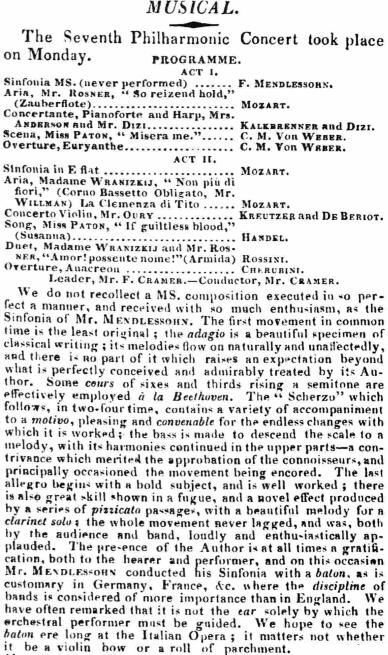 And although the names in the advert suggest their publications were only of the highest classical sort consisting of sheet music by composers such as Mozart or Beethoven, they also published more popular music as can be seen from the picture below. Metzler’s also published instruction manuals, such as Joseph R.W. Harding’s New and Complete Method for the German Concertina (1858), Metzler and Co.’s tutor for the viola or tenor (1920), and even a magazine, Exeter Hall: a monthly magazine of sacred music (1842-1881). The Metzler instruments sometimes come up for auction and a number can be found in various museums around the world. Below two examples, but many more can be found by searching the Internet. 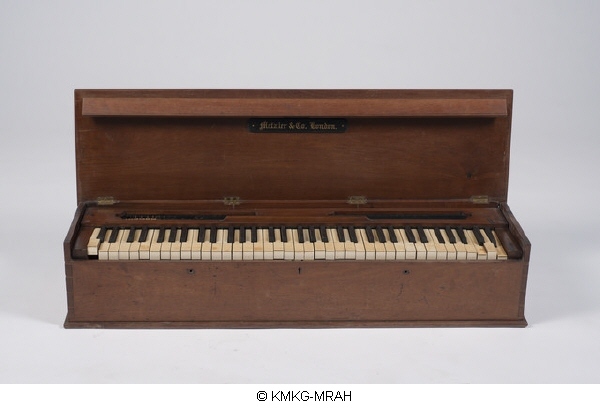 The first picture is of a boxwood clarinet that I saw advertised on Ebay (Thomas Flatt Antiques) and the second one is of some sort of piano in the Royal Museums of Art and History, Brussels (they just describe it as a ‘musical instrument’). Note the name label on the inside of the lid. 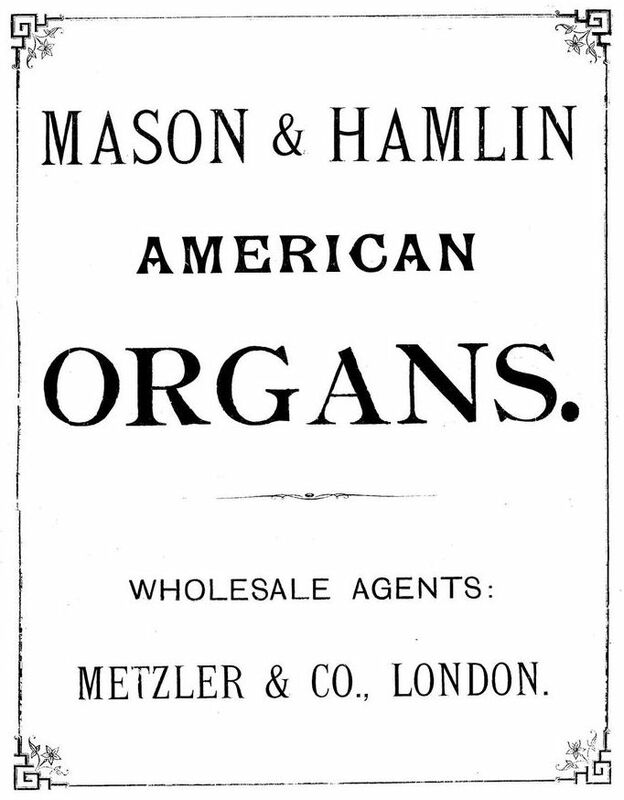 When they resided in Great Marlborough Street, Metzler’s became the agent for Mason & Hamlin, the American organ builders. 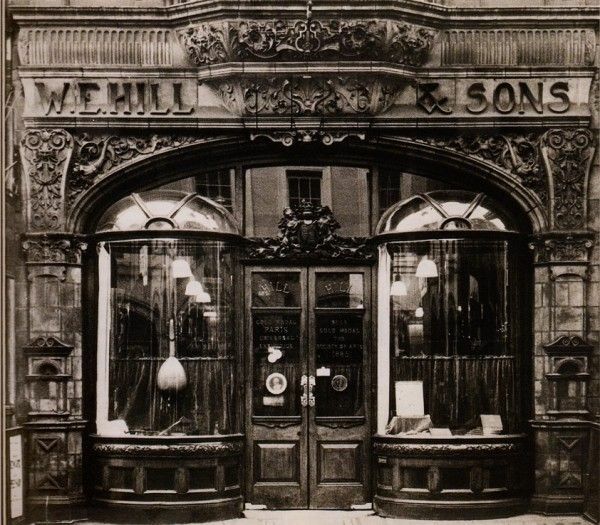 The Metzler firm, after a few more moves to Charing Cross Road and Rathbone Place, was eventually taken over by J.B. Cramer in the 1930s. (1) Grove’s A Dictionary of Music and Musicians, volume 4 (1900). (2) National Archives, Kew: BT 42/1/128. 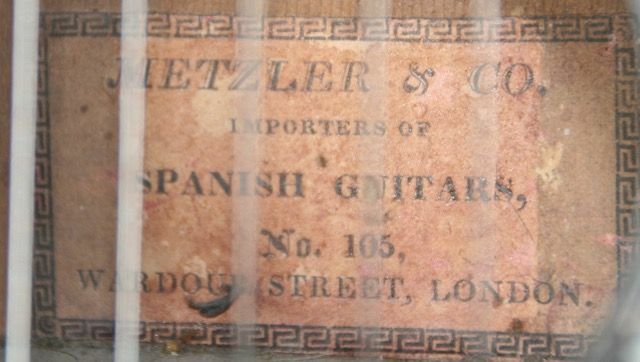 Postscript: A reader (see comments) sent me pictures of a guitar, according to the label imported by Metzler. An additional label indicates that the guitar was later sold by Alday’s in Dublin. In the street directory for Street View 82 (Charlotte Street, Fitzroy Square) we find a Mr. Cramer at number 37 without an occupation. The elevation map in booklet 82 unfortunately does not show numbers 28 to 68, although the inhabitants are listed in the directory. Quite a number of residents in the missing part of the street have no occupation after their name and I assume that Tallis considered that part of Charlotte Street, that is, the section between Tottenham Street and Howland Street, too residential for his Street Views which were basically a guide to the shops of London. Why he nevertheless decided to list the names of those living in the missing section is unclear. You will, therefore, not find the customary elevation at the top of this post, but to compensate for this gap in the Tallis information, below a map of the area with Cramer’s house marked with a cross. Charlotte Street originally only extended to Goodge Street, later to Tottenham Street and that section was also known as Lower Charlotte Street. When the street was extended from Tottenham Street to Howland Street, the new section was referred to as Upper Charlotte Street. This Upper section is what Tallis does not show on his map. The houses have been re-numbered twice in their history – to make life easy for historians no doubt – with the present sequence running from south to north, with the odd numbers on the west and the even numbers on the east side. (1) When Mr. Cramer lived in Charlotte Street, his house, which was situated on the east side, just around the corner from what is now Chitty Street, was numbered 37, but nowadays it is number 82 and part of the Saatchi & Saatchi building. Chitty Street, by the way, was previously called North Street, although Tallis in his directory calls it North Place. Sir Charles Booth (1812-1896) was the 3rd baronet of Portland Place, a gin-distiller, and no, he had nothing to do with Charles Booth, the social reformer and philanthropist. Sir Alexander Hamilton is a bit of a mystery. I had a look at the Wikipedia page for the Hamilton baronets and there is no Alexander there in the correct period. Never mind, we will concentrate on François Cramer who was the Mr. Cramer listed by Tallis. 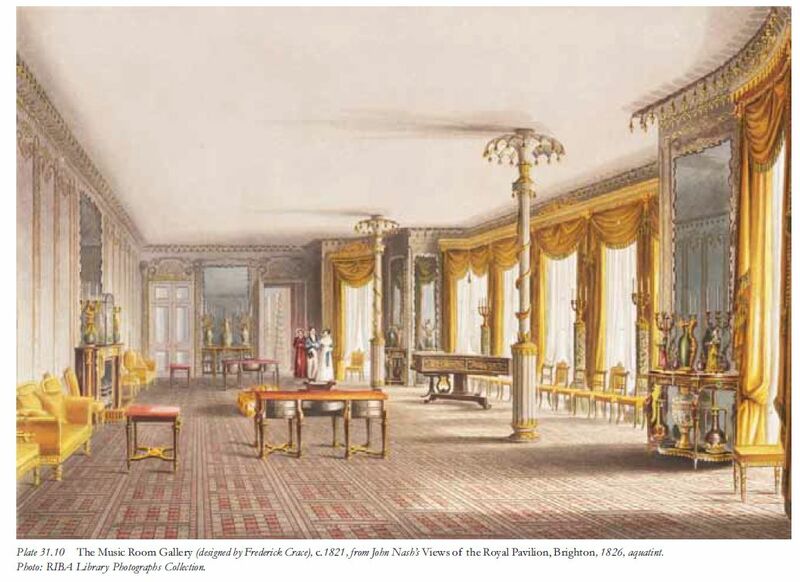 In May, 1829, Felix Mendelssohn wrote that he was in the Argyll Rooms to rehears his symphony with the Philharmonic Orchestra and that there were about two hundred listeners, chiefly ladies. Apparently, the rehearsals were not behind closed doors and the public was welcome. Mendelssohn writes that François Cramer, the first violin, first introduced him to all the members of the orchestra and then the rehearsal started. According to Mendelssohn “it went very well and powerfully, and pleased the people much even at rehearsal. After each movement the whole audience and the whole orchestra applauded”. After the rehearsal, “Cramer was overjoyed, and loaded me with praise and compliments” and Mendelssohn had to shake “at least two hundred different hands.” The actual concert on 25 May went even better and the public vigorously demanded an encore and “after the finale they continued applauding”. 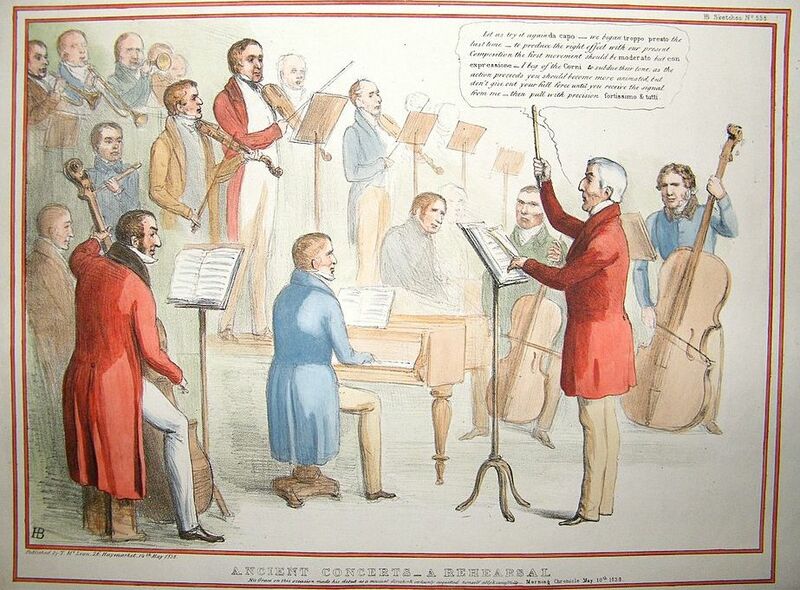 (4) The symphony he conducted on 25 May was first envisaged as Sinfonia 13, but became Symphony no. 1 in C minor op. 11 and when it was published in 1831, Mendelssohn dedicated the symphony to the Philharmonic Society. (5) As can be seen in the next illustration, it was not just Mendelssohn himself who was pleased with the way the performance went; The Morning Post of 27 May reviewed the symphony favourably and was most impressed by Mendelssohn’s use of a baton. In 1831, concern was voiced in The Spectator that Cramer was to leave the Philharmonic Society. The paper hoped that the report was not true as “the loss would be mutual: the orchestra would miss the services of so excellent and experienced a leader; and to him, or to any other of its leaders, the occupancy of such a situation must be in every way advantageous”. (6) It proved an unfounded piece of gossip, but a few years later, in 1839, a small notice appeared in The Musical World suggesting that Cramer’s health was not what it should be. “Mr. François Cramer has, we regret to learn, been dangerously ill, but hopes are now entertained of his recovery; his complaint is a nervous affection of the head, from which he has suffered most excruciating pains.”(7) but a few years later, in 1844, Cramer did resign as leader of the Philharmonic Society, continuing as a ‘normal’ member until his death. The 1841 census (probably roughly the same period in which Tallis’s Street View 82 appeared) finds François, “professor of music”, living at 37 Charlotte Street with his wife Ann and sons Henry, 22 years old, a civil engineer, Frederick, 17 years old, a builder, and Arthur, 15 years old, also a “professor of music”. 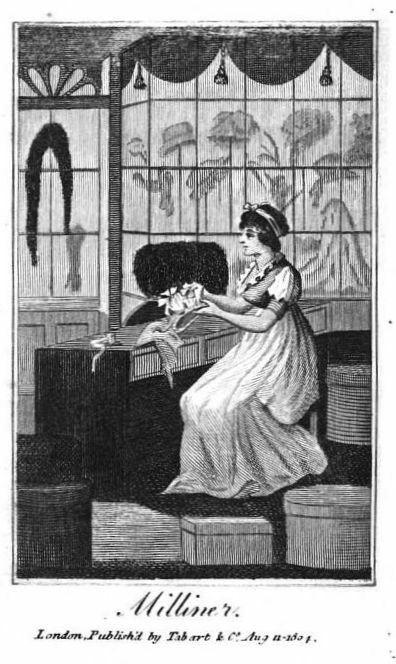 Ann is Ann Barwick Lamb whom François had married on 14 November 1806 in Brighton. 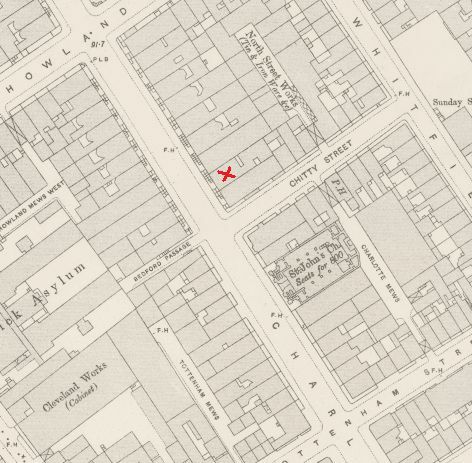 It is unclear whether the family stayed in Charlotte Street; there is a suggestion(8) that they moved to Cavendish Square, but unfortunately the next census of 1851 came too late to be of any use to determine the veracity of the suggestion. Cramer died on 25 July 1848 and was buried on the 29th at St. John’s Hampstead. (1) Survey of London: volume 21: The parish of St Pancras part 3: Tottenham Court Road & neighbourhood, 1949. (2) Biographical information from Grove Dictionary of Music. The manuscript of Cramer’s violin composition (Album Leaf) is in the British Library, as are the archival records and scores of the Philharmonic Society. (3) A. Burgh, Anecdotes of Music, Historical and Biographical; in a Series of Letters from a Gentleman to his Daughter, 1814, vol. 3, p. 445-456. (4) Sebastian Hensel (translated by C. Klingemann), The Mendelssohn Family (1729–1847), vol. 1 (2013), p. 184-185. (5) The Cambridge Companion to Mendelssohn, ed. P. Mercer-Taylor (2004), p. 96-97. (6) The Spectator, 26 November 1831. 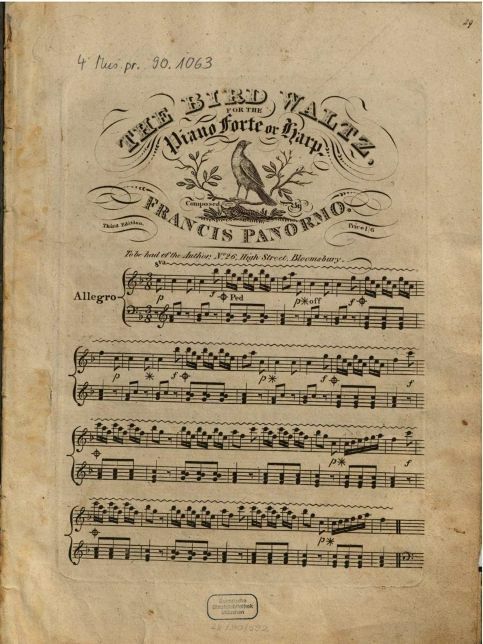 (7) The Musical World, A Magazine of Essays, Critical and Practical, and Weekly Record of Musical Science, Literature, and Intelligence, 3 January 1839, p. 14. (8) Deborah Rohr, The Careers of British Musicians, 1750-1850: A Profession of Artisans (2001), p. 38.